Yesterday was Craft Night! at Janelle’s. The plan is for this to become a regular event. Theme #1 – HOLIDAY WREATHS! 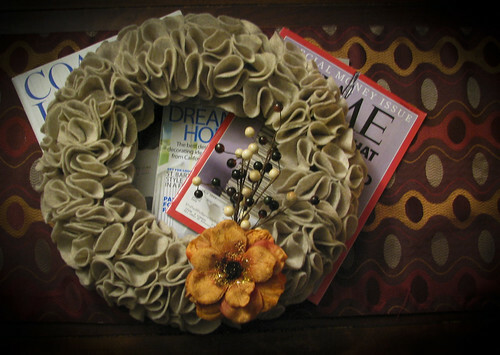 I used the tutorial on this blog to make my wreath. Looks crazy, but is SIMPLE. Unfortunately, I ran out of felt with about 1.5″ diameter left, so today I ran to Michaels over lunch to pick up an extra sheet. In the cost breakdown, most of that was felt ($2) and the flower ($2). The great thing about the flower, is that it’s a CLIP-ON! So I can switch it out for different seasons. So now it looks pretty autumnal, but I have a nice purple-y-red flower I can stick on for Christmas.